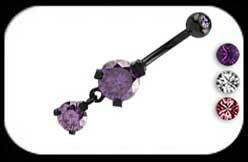 Black Steel dangly Belly Bar with 2 stones. Size1.6mm / 14ga x 10mm length. Available with Crystal, Amethyst, or Rose stones.